Seafood has been calling to us…. we finally heeded the call. One of the most improbable eateries in our area is a pop-up restaurant. 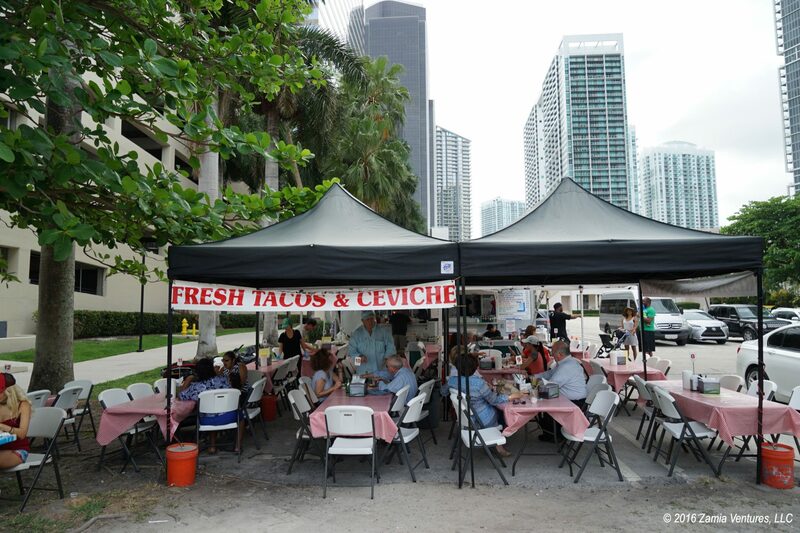 Four days each week, a food truck parks in the parking lot behind the First Presbyterian Church on Brickell Avenue and is quickly surrounded by tents which shade a half dozen folding tables. 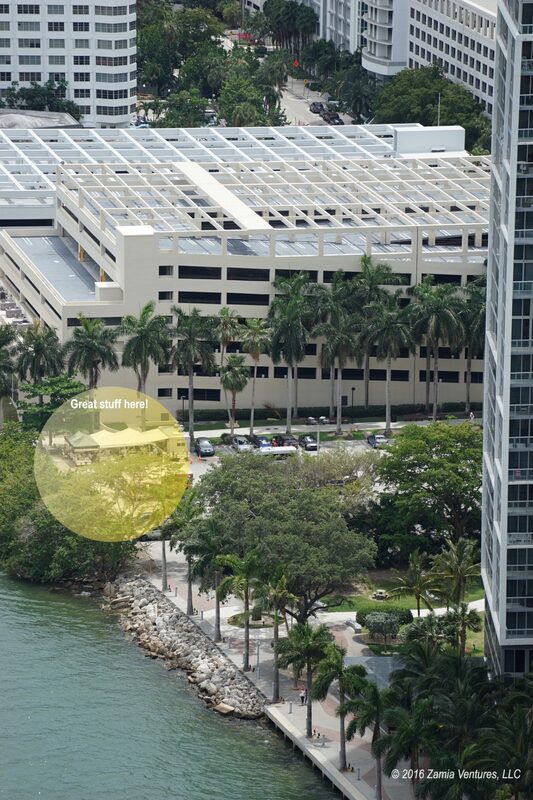 This unassuming surface parking lot is surrounded by glistening office buildings and condos, and offers a dynamite view of Brickell Key. We finally satisfied our curiosity with a visit this weekend to the only (semi-) permanent location of Surf & Turf Catering. 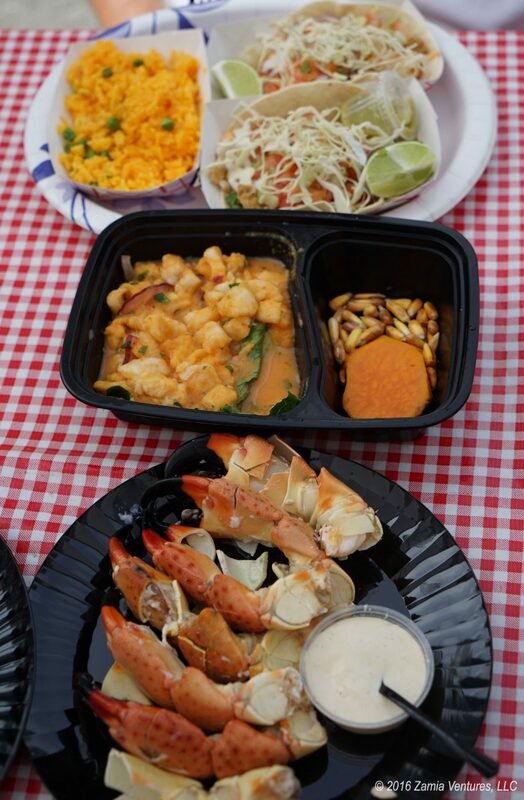 Skimming online reviews led us to expect fresh, delicious seafood, and Surf & Turf delivered. I ordered my first stone crabs since moving to Miami, Ken had snapper tacos, we shared a fish ceviche, and it was all accompanied by homemade lemonade. 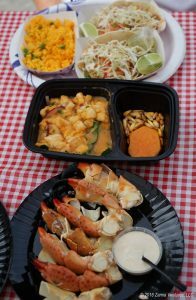 We thought the seafood was superbly fresh — probably swimming yesterday — and everything was very well prepared. I certainly appreciated that the caterer pre-cracked the stone crabs, so I had a fighting chance to extract some of the delicate meat. The ceviche was very well seasoned. The “very spicy” that we ordered was rich but not overwhelmingly sharp. Ken reported that the tacos were good…they disappeared before I could finagle a taste. 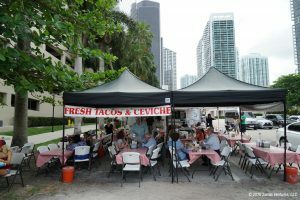 While more expensive than a normal food truck, we thought the prices were more than fair considering the quality of the food. You’d pay much more to eat inferior seafood in many nearby Brickell-area restaurants, and you would lose out on the opportunity to have a creepy iguana watch you eat. The location is even dog friendly! I am sure we will be back.